Organize your bar serving station with this 6-compartment condiment dispenser! Made of stainless steel, this bottomless dispenser has a sleek, modern appeal that provides ultimate durability and is stain and rust resistant. Six separate plastic compartments make up this dispenser so you can store your bar drink garnishes! And thanks to its bottomless design and individual removable inserts, this unit is both easy to refill, clean, and assemble. From lemons and limes to oranges and maraschino cherries, you have a designated spot for every item. Featuring a hinged, clear acrylic lid, you can easily open and close the unit to keep fruit and other garnishes sanitary and protected from debris. The lid is also clear so you can always see when your supply is running low! Great product, just purchased 2 more for our business, love the 6 compartment, very durable, easy cleaning. Would recommend this product, great value for the price. For an event I did a "sandwich bar" and used this to hold all of the spreads and toppings. It surprisingly held a lot more than I thought. It looked very clean and professional and I barely had to refil it for an 5 hour event. How do I love thee? Let me count the ways! I have used this for organizing my ingredients for making Thai soft spring rolls. It makes it a breeze to have everything in one place and makes for a quick assembly. I also use it for drink garnishes for our Cocktail Sundays during football season. It holds a variety of things like lemon and lime slices, olives, and cherries. It's a very high quality item and I love the closing lid. The containers clean up easily in the dishwasher. Great product, highly recommend! This product is durable and perfect small garnishes in my restaurant. Unfortunately, it does not hold items that need to remain cold. Overall, happy with the item. The finish is better than I thought. The bottom surface is a bit sharp, but it is okay because there is nothing to move parts other than the container. It would be even better if you have a compatible ice container that you can keep cold. This product is perfect for my business. I use it to access all the dry toppings in one place. Lightweight for easy cleaning and fast easy access. They are not sealed tight so we put them in separate container at night. Great product at a fair price. I took one star away because of the bottom being open. It shouldn't have any affect if you use it on a flat surface but for what i use it for it did. This is pretty nice. The top could be a little sturdier and I kind of expect the hinges to break at some point but its good for how cheap it is. This is a nice size dispenser for condiments and easy to clean. The flip lid on top keeps the items covered. Great for the money. Great dispensers for behind our bar - we keep extra plastic caddies in the fridge for easy change out. Lid keeps product fresh and visible. I actually use this for pancake toppings but they are most commonly used as bar accessories. Either way, super functional and the lid makes it easy to store leftovers. This product makes getting sandwich fixings out a BREEZE. The onions, tomatoes, olives, pickles, peppers, etc all have their homes. Super easy to clean. Take it all out of the cooler at once. Needs solution to keep stuff cool in this really cool looking product, or make it clear that unless the condiments are in a buffet ice tray or don't need refrigeration, it's not going to work for you. It is very pretty though! I used this for my party this past weekend. Everyone asked where I purchased!! Hopefully you'll be selling more of these. Love this item. Will use a lot. Great item. I should of ordered more and larger sizes too. Will place an order soon, and will highly recommend this web store. Thank you. Great price for what you are getting but make sure you know that this does not hold any ice. The stainless is only on 4 sides. there is nothing on the bottom. The product can fall out when you are carrying this around because there is also no support to keep it in place. I will say that the hinge system is much better than plastic versions and it does look very sleek. The stainless steel dispenser has been a great addition to our employee counter area. We have a Franke Espresso Machine that we use to create our gourmet espresso drinks and it is a nice complement. The dispenser houses our creamers, sugars and half / half packets. We have also used it for a variety of nuts for our toppings bar (Almonds, Cashews, Peanuts, Walnuts, Wet Walnuts). It has been used in a variety of ways and looks very modern / professional. This works great to hold all of our hot dog condiments. We are able to put ice packs underneath the dispenser to keep everything cold. It is nice to be able to remove all of the inserts as well for easy cleaning before we refill. This product is good ,and the material is excellent, but you don't have any space for ice. We will use it for dry products. the price is good. This is a great tray that's lightweight and easy to handle. We fill each compartment in prepping our snack stand, and it's light enough to transfer to the fridge quickly and easily with no extra hands. The option of replacement bins makes it easy for us to fill several and wrap with plastic wrap for easy replenishing. This condiment tray works very well. Each compartment can be removed separately and is very sturdy and well made. I have bought a couple of these and will buy more. we like it! we are using it to separate sugars and sweeteners to refill caddy's on the tables. Not too heavy and must be restocked often, but the removable inserts are easily washed. Keep all your bar items cool and organized with this sleek stainless steel bar organizer. It has 6 compartments as opposed to some other caddies so its great for holding multiple items. The stainless steel 6 compartment condiment dispenser is very nice. It would be nice for each slot was a little larger, but over all it is very nice. Do yourself a favor and pay a little more to have a garnish tray with a full bottom, cannot tell you how many times we've lifted this out of our cooler just to push up too hard on one of the trays and have it go spilling everywhere! If you have a way to leave the garnish tray on a flat surface without a lot of transferring (maybe for sugar packets, salt packets, salsa packets, etc.) this would work great. But if you want to store olives, cherries, peppers, lemon wedges or any of the like in this, consider a slightly better model. We use this for organizing sauces inside a food cart. It gets the job done nicely, and comes apart completely for easy cleaning A good price too. Great addition to anyone with a home bar and likes to entertain. it makes it so much easier to get drinks ready for your guests. You do not have to continue to rummage through your fridge every time you want to make a drink. Highly recommend. It looks very professional but there's not place to put a bay of ice on the bottom so for things that have to be cold, this does not cut it. I like that you can view the contents of the individual compartments through the lid. I just wish there was a space so that you could leave a spoon in the compartment when the lid is closed. Holds all my condiments: sugar, diet sugar, mustard, mayonaisse, and jellies! Helps keep the countertop free from crowinding and neatly organizes everything. Cleans with a snap! Looks professional. Perfect condiment dispenser. small in size doesnt take up much counter space. Easy to keep restocked with fresh toppings. Perfect for any business with limited space. works great but i do wish there was a bottom so i could ice it. the fact that it has no bottom also compromises it when picking it up. We are a cosmetology school and we use this in an unorthodox way. We put perm papers in it. They fit perfectly, are cleary visible to students & stay clean. 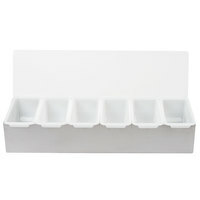 This is a great separated compartment item for offering fresh toppings and condiments for tacos. We use one for our weekly taco bar. Great for drink garnishes at the bar too. This is not only good for bar supplies but also for spices in the kitchen! If you have a few major spices you use on your cooking line this could be a huge time saver! This is the most durable condiment dispenser I have ever used in the industry. It is great and easy to clean as well as hygienic. Nice addition to any outdoor bar. I pint is plenty of space for any type of garnish. Fill all your compartments with any thing from lemons to cherries. AWESOME! AWESOME! Product. Was a little disappointed to find out there was no bottom to hold ice. I use to for my concession stand to hold limes, lemons, cherries, and whatever else I need! Good unit, great price, serves it's purpose just fine. Small enough that you can place it in a bin filled with ice if you need to. A great time saver for taco salads, everything is ready to go. Built sturdy and easy to clean with good size compartments. And as always quick shipping. The stainless steel condiment dispenser looks really great on our bar - much better than those plastic ones. And the 6 compartments fit all my fruit slices and olives.